A fire control device for anti-aircraft artillery is a calculator that determines the probable trajectory of an enemy aircraft from a series of positional observations. 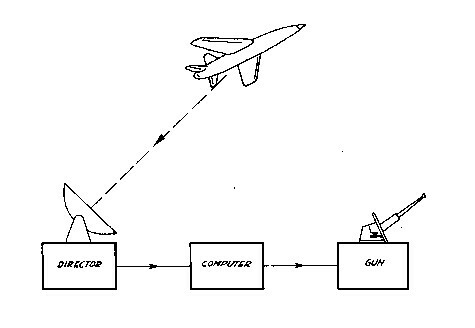 Subsequently, this device calculates the point on this probable trajectory at which a missile must be fired in order for the missile to arrive simultaneously with the aircraft. 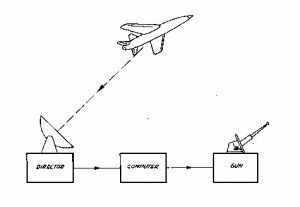 The data regarding the position of the aircraft is received by radar in the form of angles and distances. The direction in which the missile has to be fired had to be transmitted to the artillery in the form of angular dimensions. It seemed only natural to build such a calculator in so-called analogue form. The Hengelo-based N.V. Hollandse Signaalapparaten (HSA) was already very successful in the construction of such fire control devices before the Second World War. Research into digital computing technology had been going on at the Physics Laboratory TNO since 1947. This technology was then still in its infancy and, at first, appeared to have little chance of being applied on a larger scale due to the number of electron tubes that were necessary. 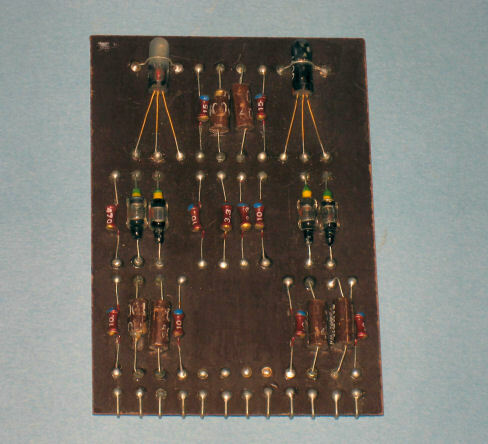 This changed in 1955 when transistors became available, which resulted in a decrease in the size of the equipment and an increase in its reliability. For the application of digital computing technology in fire control, however, a double conversion would be necessary: first from analogue to digital, and following the calculation of the firing data, vice versa. But this disadvantage would be compensated by the fact that digital technology would facilitate maintaining the required accuracy of the many calculations necessary for the fire control. If so desired, a single computing device would be able to calculate firing data for more than one firing point simultaneously. Moreover, the accuracy of analogue fire control could not be improved further, something that probably could be achieved with digital technology. 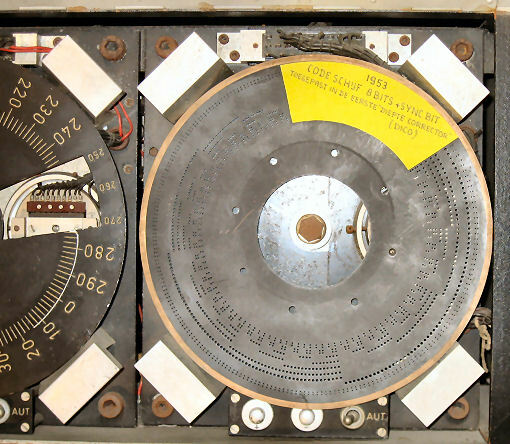 In 1952, the Laboratory developed the Depth Calculation Device (DICO) to determine the correct direction and depth of underwater targets (submarines). When calculating the depth, the influence of the acoustic refraction due to the speed gradients in the water has to be taken into account. Sound transport in water is not linear but is influenced by temperature differences, differences in salinity and pressure according to the Snellius laws. Temperature gradients and salinity were measured in advance at different depths. Their values were entered as parameters on the DICO. DICO used electron tube technology: 20-bit wide computations using 370 electron tubes and 50 voltage reference tubes (CV2213) which consumed 1,500 Watts (120 Amp). 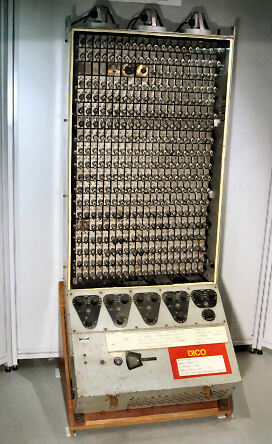 DICO had five 20-bits words magnetic core memory and three registers. Conversion of the chart angle and elevation parameters was ‘pre-programmed’ as digital numerical values that were stored as digital values in an optically readable metal code disc (1953). A multiplication took 850 microseconds. DICO was successfully tested on the Hr.Ms. Marnix. Some adaptations followed. In 1956, Hollandse Signaal Apparaten started to make a production series of the DICO. the servo guidance of axis positions from the computing device. 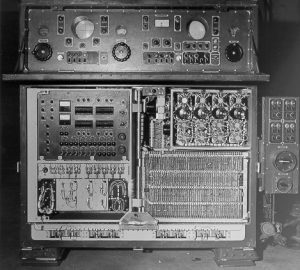 The Dutch Royal Navy commissioned the construction of a laboratory model of a digital computing device for determining the trajectory of torpedoes in 1954 (project VUTOR). This was welcomed enthusiastically, as it offered the opportunity to apply in practice the techniques that had been developed in the preceding years. The laboratory model was constructed with the then conventional electron tubes and was successfully tested on board submarine Hr.Ms. O27 in 1955. Ultimately, the large number of electron tubes, more than 600, was too aggravating for the Royal Navy to proceed with the production and operationalisation. In 1956, the development of a digital torpedo control based on transistor technology started. Signaal, Huizen would develop the mechanical part. The project was successfully completed in 1959. However, the Navy decided not to purchase the torpedo due to poor performance. As a result, the developed torpedo fire control was never operationalised. In 1954, within the framework of the Mutual Weapons Development Project, the US government provided support for European countries for the development of new weapons systems. The Physics Laboratory TNO, in collaboration with the Dutch Royal Airforce, presented a project for the development of a digital fire control device. 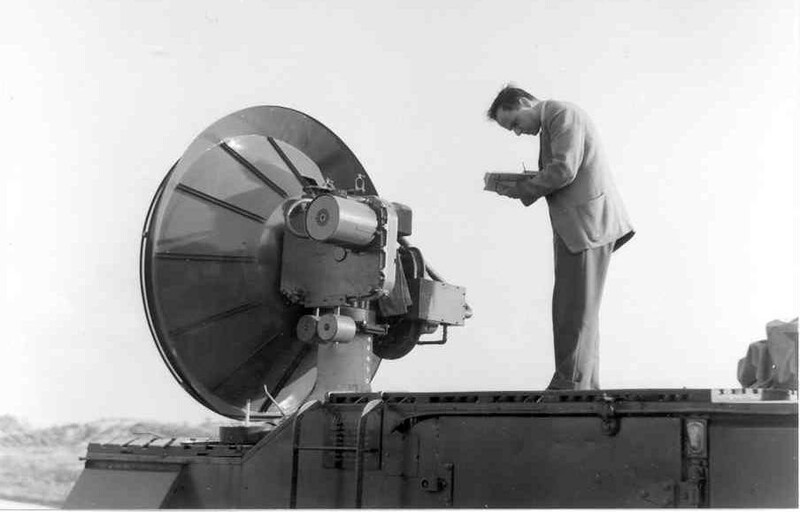 In 1955, this project was accepted under the description: ‘Development of an anti-aircraft fire-control equipment using digital computing techniques’. There was a stipulation that a Dutch company was to be part of the project. HSA decided to participate, with the result that on 3 April 1956 a contract was signed between the Dutch government, RVO-TNO and HSA, supported by the USA. This project was given the name ‘DiPhySa’, a name consisting of letters from the words ‘digital’, ‘Physics’ en ‘Signaalapparaten’. The Royal Netherlands Army was the contractor and the project was a joint collaboration between the Physics Laboratory and HSA. 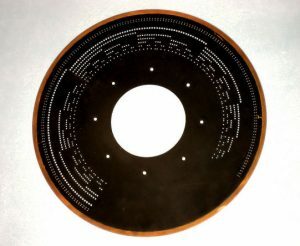 In 1956, TNO started a study on the possibilities of using very small magnetic rings as memory in digital technologies with good results. Magnetic core memory was therefore used in the DiPhySa project. The digital calculation section that processed the radar data was built by the Physics Laboratory TNO based on an earlier laboratory model of digital fire control. The calculator part that processed the firing data was built by HSA. The integration test took place in 1960. DiPhySa formed the base for the development by Signaalapparaten (HSA) of the L4/5 fire contropl for the Royal Dutch Army. The digital fire control technology attracted international attention. As early as April 1957, a delegation of the Physics Laboratory, consisting of three engineers, visited six American research establishments to explain the advantages of digital fire control, at the invitation of the Office Chief of Ordnance, US Army. They were given the opportunity to sound out their ideas with their US counterparts. And in 1965, the Norwegian representative in the NATO Defence Research Directors group referred to project Diphysa as a successful example of a ‘hardware project of magnitude developed in a small country’. The main part of this page is based on writings by the late Prof. Ir. IJ. (IJsbrand) Boxma.